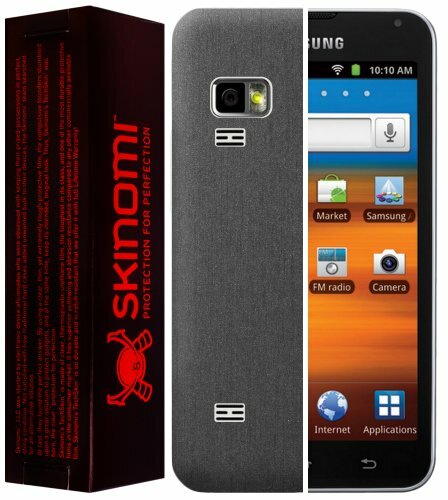 The Skinomi Brushed Metal Series Film Protector implements the latest break-through in mobile protection to provide a lightweight yet effective protective barrier against damage to your device. At just .1 millimeter thick, the protective skin was engineered to withstand scratches, nicks and scrapes, without adding unnecessary bulk. It features a semi-shiny metallic look that not only appears like it's made from real metal, but is also texturally identical. The Film goes through a specially engineered manufacturing process to ensure an accurate fit for your device without hindering any functions. Installing the Skinomi Brushed Metal Protector Film is easy and does not require liquid. The adhesive side of the skin is specially engineered with a grid-like pattern that allows air bubbles to escape during installation. This grid helps the skin adhere completely to the device by extracting gaps and pockets of air, which prevents unsightly peeling. Finally, this innovative type of film remains cool to the touch. Brushed metal texture gives your device a one-of-a-kind sleek look that is also cool to the touch. If you have any questions about this product by Skinomi, contact us by completing and submitting the form below. If you are looking for a specif part number, please include it with your message.